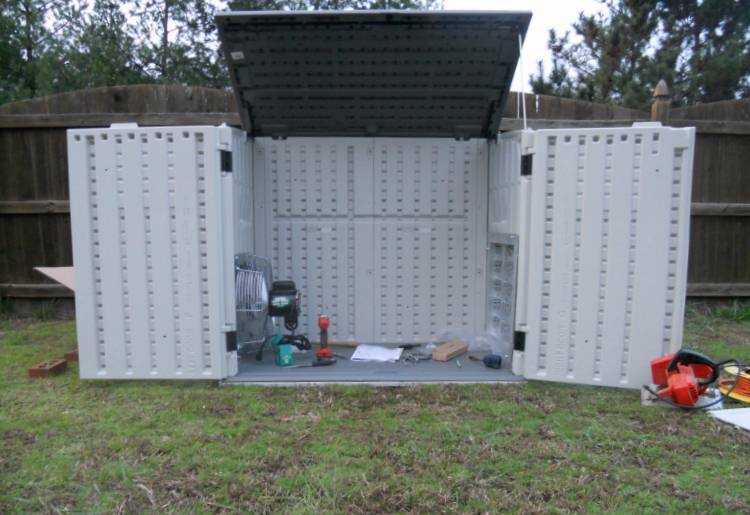 into an enclosure for your portable generator. Works with Suncast model BMS2500 storage shed available from Lowes and BMS3400 from Home Depot. Also works with larger BMS4700 shed. Buy our kit if you will obtain shed locally or from online retailers. Or buy our assembled version which includes the shed. The PowerShelter Kit II is designed to convert most metal walk-in type garden sheds so they can house your portable generator outdoors for both storage and operation. This kit also worked with the now discontinued Suncast GS2000 series shed. Vents with automatic louvers to keep out rain, birds, rodents and most insects. 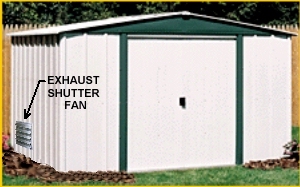 Select proper location of generator and vents in shed. Select method for routing power cable out of shed. Cut two square vent holes in shed walls (if possible before assembling shed). Install intake shutter and motor operator. Route and connect all power wiring. Install high temperature cutout on generator and test for proper operation. Mount exhaust deflector or exhaust adaptor. Test generator along with fan and intake damper. ** Power requirements for fan motor plus solenoid operator on intake shutter. Derate generator Wattage by this figure. * When framing a rough opening add 1/2" to these dimensions. So, for a 16" square shutter frame the opening at 16.5" x 16.5". When cutting a tight opening in BMS shed wall add 1/8" to these dimensions. So, for a 16" square shutter frame the opening at 16.125" x 16.125". We have designed this kit with safety in mind. However, whenever fuel is used to operate an engine generator there is always a risk due to fire, exhaust gases and electric shock. This kit will not eliminate those risks. If a fire develops, metal sheds will not contribute to the spread of the fire but sheds made of flammable materials could feed a fire. 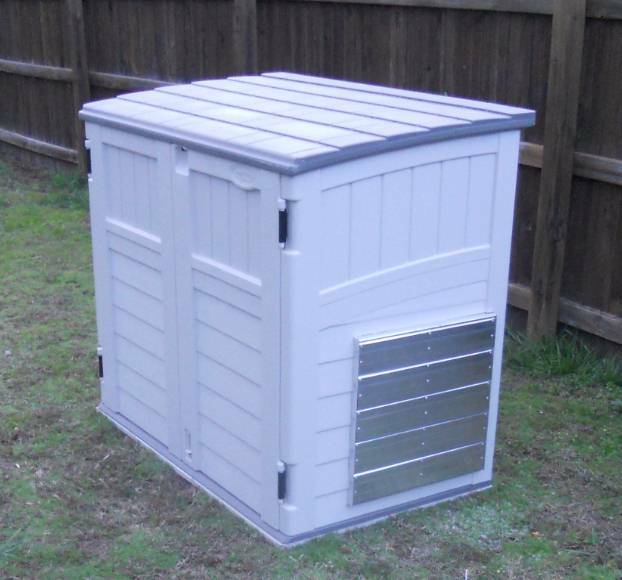 Therefore we recommend the use of sheds made of non-flammable materials. WARNING -- failure to follow the directions for construction and use of this product can cause serious injury to persons and property. Read all directions fully before attempting to modify your shed and use only as directed. We DO NOT recommend that this kit be installed in any space that is part of a dwelling or attached to a dwelling. 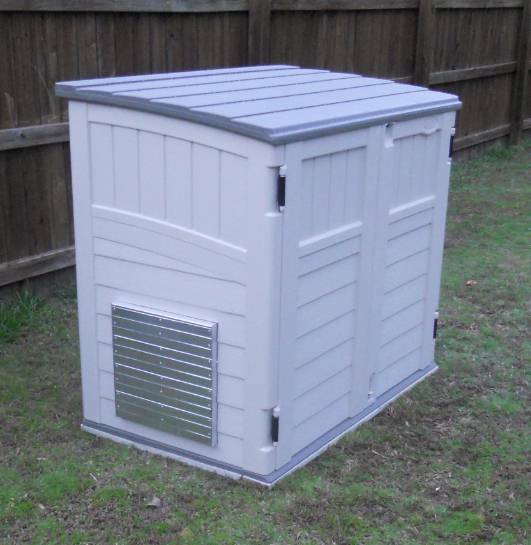 Metal garden sheds can be purchased locally at many home centers such as Lowes. Costs start at about $230.00. 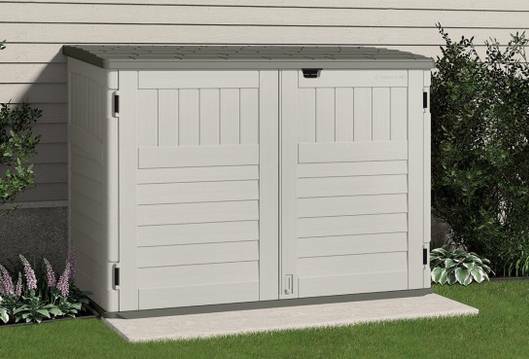 The Suncast BMS2500 storage shed can be purchased at Lowes. The similar Suncast BMS3400 can be purchased at Home Depot. But these are limited to generator sizes up to 7999 watts. Note also that the Suncast sheds are made of plastic resin and will burn if exposed to fire. And even though they have provision for a padlock they are not very theft resistant. A determined thief during a power outage could break into the shed and steal the generator. If you do not already have a transfer switch or panel you may click here to order one from our wide selection. You will also need to obtain any necessary building wire and a junction box locally if you wish to hard wire from the transfer switch to the PowerShelter. We also sell panel interlock kits here. This item normally ships in approximately 1-2 weeks or less. Suncast BMS2500 and BMS3400 storage sheds are limited to approximately 7999 watts. Higher capacity generators require a larger fan and intake shutter and can be installed in the BMS4700. NoOutage assumes no responsibility for results when exceeding this recommendation in these or similar sheds. 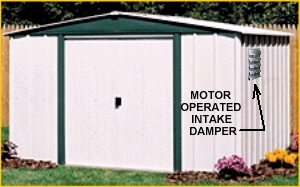 Shed size is requested so we can provide the proper length intake shutter wiring.